Building a home in the real world. At SLA, like at many schools, we emphasize the importance of doing things in “the real world.” If at all possible, projects are designed to be shared publicly, and also to make sense to the general public — not just to the people who read the instructions. Sometimes, this means we’re posting public art next to the school. Sometimes we’re planting a community garden. Students apply to and speak at conferences, travel around the world on service trips, and generally feel connected with what’s going on beyond the school’s walls. A bit tricker, though, is our online content. 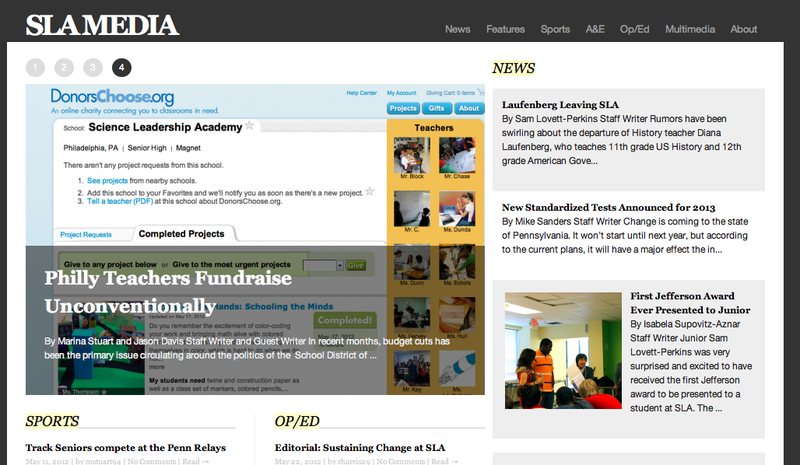 The easiest way to share is to post on our class blogs — and we do that plenty. I love reading, viewing, and listening to work posted there, but the emphasis is often more on a student’s individual portfolio than the collective effort of a project or a class. Going this route made me more aware of other student-centric sites in the area, like UPenn’s The Blacktop and Mighty Writers’ forthcoming Mighty Post. When media was print-only, students were relegated to the annual newspaper poetry contest or maybe a letter to the editor. There are a few outposts for printing student writing at the “professional” level — The Concord Review and The National High School Journal of Science come to mind — but those are few and far between. Now that we’re online, professional venues still don’t make much room for student writing* — but they’re conveniently no longer the gatekeepers. We can set up our own showcases, not just in emulation of professional organizations but at their level. With all this in mind, fellow 11th Grade English Teacher Meenoo Rami and I have just established The 2Fer Quarterly. Students will be invited to post 2Fers — not every essay, but the ones they think are best — in a venue that, quite simply, is designed to be classy. Expect independent ideas and commentary on everything under the sun — science, humanities, media, politics, technology, and hopefully some criticism of 2Fer writing itself. Are we going to get the same traffic as Slate or Salon? Goodness, no. But we know there’s an audience out there for us, and we hope that you’ll be a part of the process and the conversation. *A notable exception is The Huffington Post, which does feature columnists who are at the college and high school level — although usually only for education-related topics. This entry was posted in SLA, Writing on September 3, 2012 by lpahomov.